This all started because Orion’s Maks are “wrong-handed” for their VersaGo II alt-az mount. Here, I’ll show you what I mean. Here’s my Apex 127 on the VersaGo II. If the scope is sitting on its dovetail bar, the dovetail shoe for the finderscope is on the left side of the scope, at about 10:30 (viewed from the eyepiece end). So when the scope is mounted sidesaddle on the VersaGo II, where the dovetail faces left, the finder ends up at about 7:30. The eyepiece of the finderscope is a bit below the eyepiece of the main scope (the effect is exaggerated in this picture, which was taken looking down at the mount). This isn’t terribly inconvenient, it just looks weird, and it can cause some slight balance problems when the scope is aimed up high. What I’d like is to have the finder sticking straight out sideways from the scope. That way the eyepieces would be at the same height, and the altitude axis of the mount would run through the centers of mass of both scopes so there would be no balance problems. I could achieve that by moving either the dovetail shoe for the finder or the main dovetail rail, but that would require drilling holes in the scope and I’m not willing to do that. A better solution is just to get some tube rings, so I can orient the scope and the finder shoe however I want. 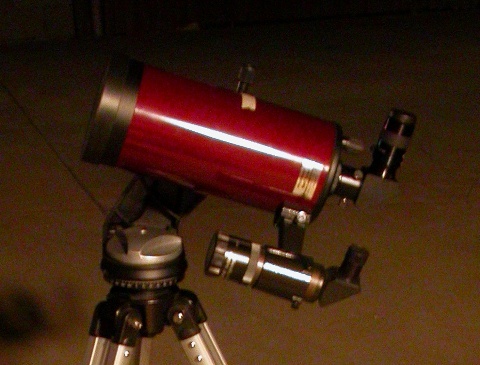 Thinking about that led me to think about how nice it would be to have a small refractor mounted alongside the 5″ Mak. Something in the 70-80mm range could function as both a “superfinder” and rich-field telescope, so on one mount I’d have a low-power, widefield scope and a planet-killer. Stellarvue sells an 80mm superfinder that some folks use as a stand-alone rich-field and spotting scope, but that runs something like $250. I’m sure it’s nice, Stellarvue gear is top notch, but as always I am interested in less expensive options. Celestron’s Travel Scope 70 is not much smaller, it’s gotten generally good reviews (at CN, for example), and it can be found for $60-80 (the Amazon price fluctuates a lot, but other vendors usually have it for $60). That would work for a finder, but I’d have to mount it somehow. I could just buy some mounting rings, but adjustable mounting rings for a 70mm scope would cost more than the scope itself. There has to be a better way. So that’s the first thread: moving up from a 50mm finder without breaking the bank. The other issue is that I have several scopes that I use regularly, and only one 9×50 RACI finder. So I keep moving the finder around, and this is kind of a pain, because I have to realign it for every scope. It would be nice to just park it on one scope, but that means I’d need finders for the other scopes. As before, I could just buy some more RACI finders, but the 6×30 models are about $60 and the 9x50s , which I really prefer, are $90 or more. Now, I could build my own finder. I have spare 50mm objectives from some cheap binoculars, and I have an erecting prism diagonal, and I could build the tube out of plumbing parts. But that still leaves the problem of mounting, and as before, the mounting rings would set me back almost as much as a new finder anyway. That’s the second thread: adding 50mm finders without breaking the bank. It’s been a while since I’ve bought a new finder, and I have to admit that the prices kind of took me aback. I can’t shake the thought that the Celestron Travel Scope 50 runs about $45 and the Travelscope 70 is $60. If only I could find some way to mount them, I could have easily focusable luxury finders for less than new RACIs of smaller aperture! And that’s really the rub in both of the threads of thought outlined above: building a finder-quality scope is not hard. 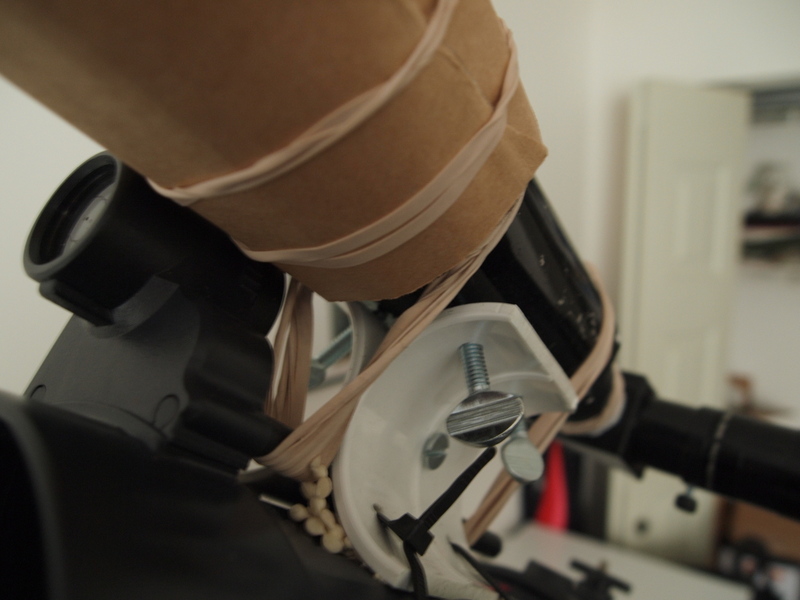 Mounting it solidly, reliably, and conveniently is hard. Part of what you pay for in a commercial finder is a sturdy, easily-adjustable finder stalk with a standard dovetail foot. Well, what if I built my own finder stalk? This one is by CN user Grendel, and is made from cardboard tube–as is the finder, as shown in this post. I think this one is from the same thread, but derned if I can find the original post now. Anyway, it’s not my photo, I’ll credit it properly if I figure out where I found it, if it’s yours please chime in, etc. The nice thing about this one is that it’s easily adjustable, thanks to the combination of thumbscrews through the half-pipe and rubber bands pulling the finder against them. Note the zip ties holding the half-pipe mount to the main scope. So these got me thinking about the possibilities of the half-pipe mount. Here are some sketches I knocked up in GIMP. The one at the top is simplest, just a V-slot, essentially the same as in the previous photo. The finder would have to be held in with rubber bands, elastic, velcro straps, or zip ties. Alignment could be done with bolts (you could either tap threaded holes or drill simple holes and epoxy nuts on the outside) or shims. At lower left everything is the same except a trough has been added to cradle the finder, which might make it easier to use. I don’t know that, obviously, just kicking ideas around here. At lower right is a full ring holder. I figured, if you’re putting alignment bolts through anyway, just make two more holes and you’ve got a six-bolt alignment system just like on the commercial rings (see an example in the photos here). The key thing isn’t finder alignment, though, since even rubber bands and shims would work there. The key thing is convenient and repeatable mounting and unmounting to the OTA. 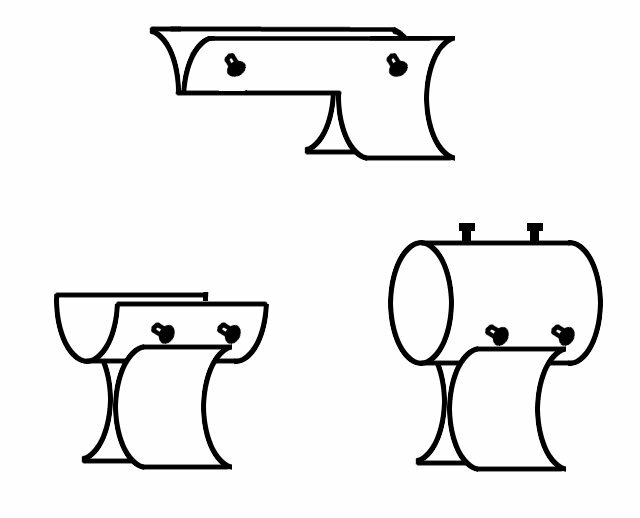 I got to thinking: with an inverted V-shaped foot, like all of these have, is there any reason it coulnd’t be cut and sanded to fit into the existing dovetail shoes, so that the dovetail retaining screw tightens on one side of the inverted V? If that could be made to work, this kind of finder base could be mounted and unmounted and moved between scopes just as conveniently as one of the commercial jobs. The end of all of this thinking? I got a piece of ABS pipe when I was at the hardware store to get parts for my sun funnel. I’m going to play around and see what I can come up with. If I find a workable solution, I’ll post it. That first pic looks like my C90 mounted on the Versago II (except I’m using the tiny stock finder scope instead of a RACI). Although I’ve never looked through a 9×50 RACI, I have an Orion 8×40 non-RACI mounted on my ST80-A. It’s like having a second telescope attached to my short-tube, making star-hopping a pleasure. However, the finder also seems like overkill on a fast 80mm F/5 scope. Even Ed Ting replaced the finder on his Orion ST80 (his came with a smaller 6×30) with a red dot finder! On the slower C90 Mak, using the ST80-A’s 8×40 over the former’s stock 8×21 makes more sense and vice versa. Fortunately the finder brackets and dovetail shoes are compatible between the two scopes, so I’m going to make the switch permanent after this comment is posted. Good luck with your finder stalk/mount for your 127 Mak! It’s like having a second telescope attached to my short-tube, making star-hopping a pleasure. However, the finder also seems like overkill on a fast 80mm F/5 scope. Yeah, it has never made sense to me that Orion puts a nice-sized 8×40 finder on the ST80, which probably needs no finder at all with a long f/l eyepiece, and puts stingy little finders on its Maks, which really benefit from big honking finders. I mean, I understand the economic argument that it costs more to put good finders on the Maks and might also keep customers from buying accessories for them, but that should also apply to the ST80 where they’re just giving away these nice big 8x40s. They could put the 8×40 finder on the Apex 127, move its 6×30 finder to the Apex 90, and move the 8×21 finder from the Apex 90 to the ST80, without making anything new, and all of those scopes would be equipped with more sensible finders. I just can’t understand it. Ha, thanks! It didn’t occur to me until after this post was done and up that the proposed homebuilt finder mount really doesn’t solve the problem of my 127’s finder being in an odd place. That will only be solved by rings (unless I zip tie a half-pipe mount to the tube, as in the second CN photo). But I’d already made the leap internally to rings = chance to mount a superfinder, and that does require me to solve the homemade finder mount problem, unless I want to pay more for the mounting system than I do for the superfinder. It’s supposed to rain all weekend, so I’ll have plenty of time to tinker. I’ll keep you posted! I just switched the finders & brackets between these two scopes (C90 and ST80A). On another note, I see that Orion has reduced the base RETAIL price (not the sale price) on the ST80’s starting this year (from $229.95 to $199.99 for the ST80-A, $199.95 to $179.99 for the ST80-T). All the accessories in both versions are the same as before. I’d been thinking about getting the Orion Skyview Mini-Altazimuth Mount ($299) so that I can view the skies with these two scopes side-by-side, but the only review I found for it was pretty negative (one star) and the reviewer advised to keep clear of this product. One more thing: I’m still curious as to how/why you obtained Stubby Fats, your Skywatcher Newtonian (I don’t think you ever wrote a blog about it). I first saw a picture of it when you did your piece on the Shorty Long (your Skywatcher 80mm scope with the AZ4 mount) and immediately assumed it was an F/5 parabolic. 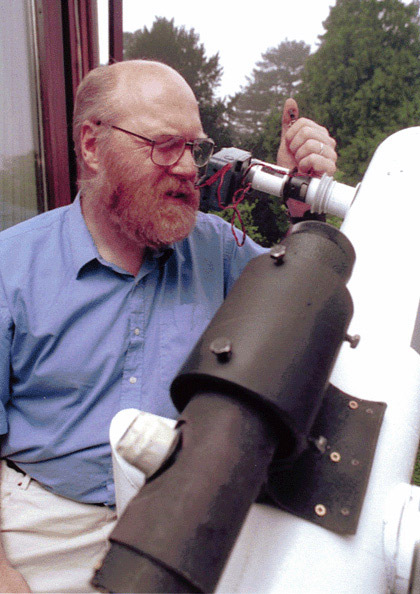 I’m thinking you were dissatisfied with your slightly longer focal length spherical Skywatcher Newtonian (mounted on a homemade Dob) and Stubby was one of those scopes Skywatcher USA was deep-discounting because they were discontinuing the product. I also have a 130mm F/5 parabolic Newtonian – the Bushnell Ares 5 collapsible Dob – which has given me a tantalizing taste of what a larger aperture scope can offer (100mm to 130mm is a big jump) the few times I’ve taken a peek through it in light polluted skies. And I haven’t even yet taken a look through my 150mm Starblast 6!